Hal Walker grew up in Kent, Ohio blowing the harmonica along the banks of the Cuyahoga River. A natural-born musician, he is one-of-a-kind. His diverse, unique style delights audiences of all ages. His original songs celebrate work, community and the creative process. He composes and improvises on the guitar, piano, harmonica and other instruments that you probably never even knew existed. 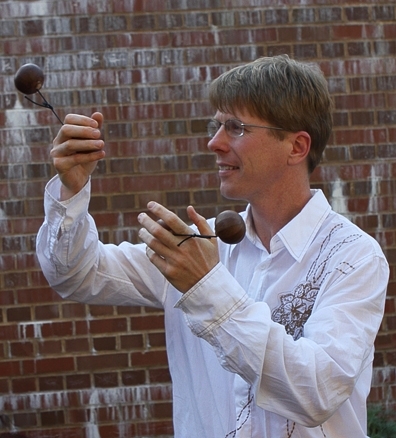 In collaboration, Hal Walker has developed a modern version of a traditional African instrument called "Banakulas." (Ba-na-�ku-la.) Bringing harmonicas and banakulas into schools all around the state of Ohio, he has provided thousands of students with a foundation for a lifetime of playing music "that fits in your pocket." With a subtle force, Hal Walker brings music into the daily lives of Ohio�s schoolchildren. Hal lives in a house full of musical instruments in Kent with his eleven-year old banakula-playing daughter, Hallie. "...virtuosic solo musician Hal Walker plays a fascinating variety of international instruments including a Thai khaen (a vertical harmonica), and African banakulas." "...the amazing, if sometimes carny-awesome, talents of musician Hal Walker. He makes audaciously interesting music from bouncing balls or the boing-boing reverb of a jew's-harp." "...virtual one-man band, Hal Walker commanded attention with his collection of traditional and invented instruments. He took center stage to play ocarina and Jews' harp, then sat on the sidelines to make music on concertina, harmonica and a strange contraption that sounded like train whistles playing in harmony."